I didn’t watch the witch hunt that was televised today (Thursday September 28th, 2018) although I have seen several stories in the media telling me how everyone else did watch. That would be their time to waste in watching the execution of a good woman’s reputation. I didn’t watch just like I didn’t watch the debates with the Orange Hate-Monkey. Brett Kavanaugh is lying now, just like the Orange Hate-Monkey (OHM) was lying then. Everyone knows Kavanaugh is lying. They know he is lying because he refused to ask for an FBI investigation when prompted. Repeatedly. So everyone in that Judiciary Committee hearing knew he was lying, but they all have to stick to their scripts. The Judiciary committee Senate did burn the woman. The professional. The established doctor with a life and reputation of her own on the line. They always burn the woman, or as I said recently, #IBelieveHer and That Still Isn’t Enough People. Do you know how we know that Mueller’s investigation isn’t a witch hunt? There are no women accused. There are no women accused and the Orange Hate-Monkey is still in office two years later. If the OHM had been a woman, if Hillary Clinton had won the election in 2016, there would already be a high rise built on the spot where her body was burnt eighteen months ago. Because witch hunts come to a speedy conclusion and they inevitably convict innocent people. I started to watch the debates between Beto O’Rourke and Ted Cruz last week. Ted Cruz was lying before he even got out of his opening comments. What’s the point of listening to defacto, demonstrable liars? People who start off lying and never stop lying, playing dirty, blaming others for their behavior? Save yourself some time, spare yourself and the furniture the wear and tear of torment like that. They’re lying, they’re going to keep lying, so let’s get on to the next thing. What is the next thing, you ask? filling the streets of Washington DC with enough people that normal life comes to a standstill until this travesty of a Presidency comes to an end. That has been the next thing that needs doing since January 20, 2017. I wake up every day, right here, right in Punxsutawney, and it’s always February 2nd, and there’s nothing I can do about it. 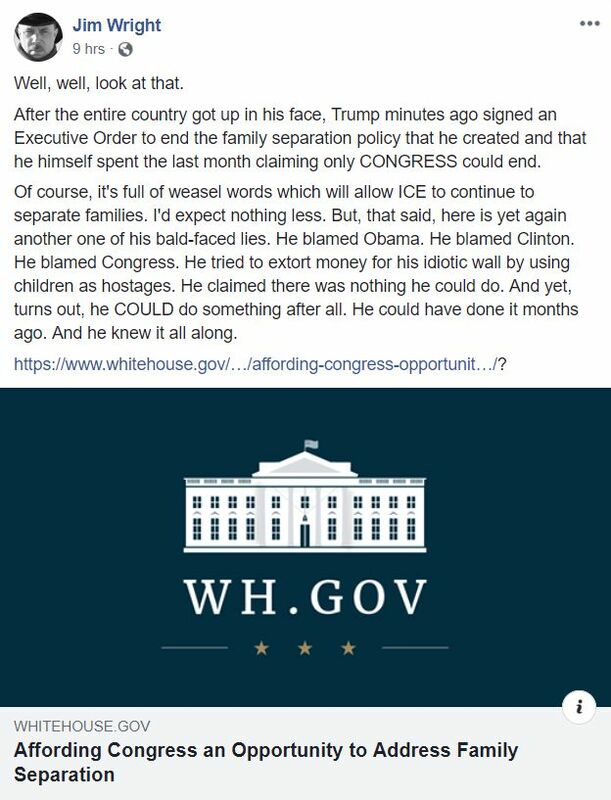 After the entire country got up in his face, Trump minutes ago signed an Executive Order to end the family separation policy that he created and that he himself spent the last month claiming only CONGRESS could end. Of course, it’s full of weasel words which will allow ICE to continue to separate families. I’d expect nothing less. But, that said, here is yet again another one of his bald-faced lies. He blamed Obama. He blamed Clinton. He blamed Congress. He tried to extort money for his idiotic wall by using children as hostages. He claimed there was nothing he could do. And yet, turns out, he COULD do something after all. He could have done it months ago. And he knew it all along. No one who’s read this damned and damnable executive order, has read it and isn’t a stormtrumper, seems to think that anything will change tomorrow. Frankly, I don’t see how anything can change tomorrow, which means that the outrage and lawsuits have to continue until we #ImpeachTrump, because the Orange Hate-Monkey (OHM) doesn’t know what the truth is. If there is one thing we can say for certain about the OHM, it is that he does not have a personalized conception of the truth beyond whatever the words coming out of his mouth at that very moment are. Some people would call that stupid, some people would call that moronic. I simply refer to it as Real Estate Developer’s syndrome, something that everyone of them I’ve ever met seems to have in common. For days I’ve been reading and posting news stories about the Trump administration’s policy of family separation. 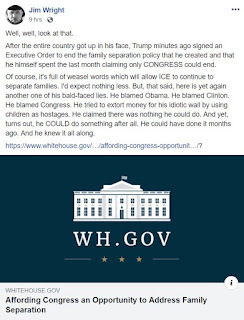 This policy is the most inhumane and unAmerican thing that the OHM has done to date, but I don’t think he’s done with the outrageous behavior on the subject of immigration yet. Not by half, even. He can’t stop. This is exactly what he campaigned on. This is why people voted for him. This is what his base wants him to do, punish immigrants to whatever level it takes in order to make the immigrants leave. To make asylum seekers go elsewhere. This is what his cabinet officers and advisors who have spoken on this subject have been saying for weeks now, that punishment is the goal and self-deportation is the desired outcome. So he can’t be done and this practice will continue in some form, possibly in exactly the same way it has been going on for months. Going on in our name. Rachel Maddow broke down on national television Tuesday night just reading about the tender age shelters, the Trump administration’s euphemism for places where they put babies they’ve torn from their parent’s grasp, or tricked them into surrendering voluntarily. So we’ve gotten to a place where talking heads, people trained in the art of maintaining calm in the face of anything the news throws at you, talking heads breaking down in tears at the news that babies have internment camps that they are being sent to. Babies. In internment camps. Let that idea sink in for a few. The defenders of these policies have a few valid points. The first one is that the parents in question are breaking a law, it is a misdemeanor to cross into the United States except at border crossings. A misdemeanor that would not even get you arrested were it not involving the convoluted subject of immigration in the United States. This law has almost never been subject to prosecution until now, but the OHM is correct that he can have these people prosecuted, and does want these people prosecuted. That is the job of the executive branch of the federal government, 100% his policy in spite of every protestation he has made to the contrary. The second point is that there are many American children who go to sleep each night in worse conditions than these children in internment camps on the Southern border. This is also demonstrably true. I myself had days when three hots and a cot were more an aspiration than a reality when I was a child. However, the fact that many children face worse treatment and housing conditions in the US is not a justification for treating the children of asylum seekers as badly as we treat our own citizens; rather, it is an observation of just how far the poor in the US need to be elevated in order for them to meet the standards set by governing bodies all around the world for treatment of refugees, let alone what the citizens of the wealthiest nation on the face of this planet should be able to expect from being among the chozen few who get to live here. 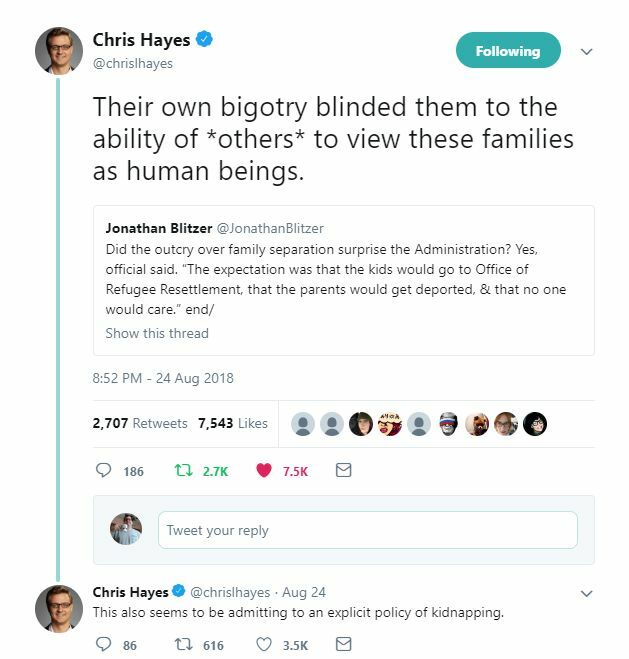 There should be a backlash by Americans over the treatment of children who had the misfortune to be born outside the US in a time of global unrest. People who are no different than we would be if we were forced out of our homes and made to seek charity from the tender mercies of the more fortunate. Let us hope that the people we are faced with, should such a misfortune befall any of us, are more forgiving than we have been. We need to send a clear signal to the rest of the world, and we need to do it now. #ImpeachTrump. Do it now. Do it before more horrors are committed in our names. The OHM’s administration failed to meet family reunification deadlines set by the courts today. So the torment of children and their parents at the hands of the US government continues. These are our dollars at work here. This is our government. If you voted for Trump, you voted for this to happen. Understand the horror you have created here. Child abduction is not a political issue. Abducting children and imprisoning their parents for crimes they were given no alternative but to commit can’t be a political issue because there’s nobody out there aside from slavers that think that stealing children is a good idea. I will go so far as to say that I don’t even think immigration should be a political issue. You live here, you work here, you pay taxes here? Welcome, citizen. I don’t know what other requirements for citizenship there should be aside from saying I want to be a citizen and proving your upstanding status (again, live, work, pay taxes) I’m singularly uninterested in there being an underclass that can be subjected to lower wages and fewer rights so that I can get my tomatoes a few dollars cheaper. I’ll pay more for produce. Institute a guest worker program with a path to citizenship, screen everybody and then let them get to work. It certainly isn’t rocket science to make the immigration system function, we just have to admit that we need the workers and that we want to do right by them. Asylum seekers are being stripped of rights under the current regime. 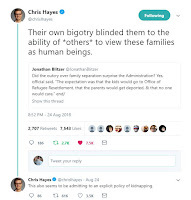 It was bad enough when Obama allowed ICE to house children in detention centers when they were coming over the border unaccompanied (and with parents) back in 2014 seeking asylum. But at least those kids got asylum hearings and were dealt with in a legal fashion. This travesty has to end, and it isn’t just Trump to blame. Every Republican in congress could have stood up and fixed this problem back in 2010 and every year since. They haven’t. They haven’t even tried, aside from Rubio, who backpedaled from his own bill so fast you’d swear someone else had written it. Shame on them, is all I have to say. Shame on them and everyone who voted for them. Like the article on Puerto Rico, this article and the other open-ended #ImpeachTrump articles will be updated as I run across more substantial stories that alter or strengthen their core arguments. The hashtag that should be trending if you think this is the election issue to motivate voters? How about #TrumpInternment2018? That has a nice double-entendre to it. This is 100% on Trump. Nobody else. His administration, his policies, his fault. Not to mention the hundreds of other children not reunited, that the US will now be sued over because of Trump’s ham-handed policies that violated international and US law. Grounds for impeachment, yet again. At the Nogales pedestrian port of entry in Arizona, some families with small children waited for up to two weeks before a U.S. Customs and Border Protection (CBP) officer allowed them to come through and ask for asylum, according to the Kino Border Initiative, a binational organization that gives aid to migrants along the border. On a recent visit to Nogales, four families were waiting. Two had spent the night on the makeshift camp at the port of entry. All of them waited for at least two days to be seen by a CBP officer. And on that day, agents processed only two families. This inaction is what is forcing asylum seekers to cross the border illegally. This summer, in a project designed by ProPublica, 10 news organizations are sharing information to flesh out the hidden details of families separated by the Trump administration’s zero tolerance immigration policy. Bob speaks with Selymar Colón, digital managing editor at Univision News, one of the organizations involved in the collaboration, about how the consortium has investigated and reported on some of the 200 tips it has received —and about the four families that were reunited after their stories were published. Perhaps this was what the Trump administration was thinking they would rely on when they tried to fob off the chore of reuniting these poor people with their children. As usual, when it comes to the OHM’s lack of thought on a subject, they mistook this effort for the efforts of the ACLU. Perhaps if he read things instead of relying on visualizations, he would look less ignorant to the outside observer. After U.S. Attorney General Jeff Sessions announced the Trump administration’s new “zero-tolerance” policy in April, the U.S. government faced a national outcry. This new policy meant all adults crossing the border illegally would be criminally prosecuted. A consequence of that shift has meant that thousands of immigrant children have been torn apart from their parents. Since then, and under a judge’s mandate, the federal government has been scrambling to reunify families. In part one of a two-part episode, Latino USA breaks down the aftermath of the family separation crisis and explores what happens to the hundreds of kids who still aren’t reunited with their families because their parents have been deported. Juan Sanchez first gained national notoriety back in June of 2018 when Oregon Senator Jeff Merkley flew to Texas to try and tour a shelter that he believed was housing children who had been separated from their parents under the Trump administration’s new “zero-tolerance” policy. Senator Merkley was denied access to the shelter and was even questioned by police who were called by the shelter’s staffers. There seem to be two opposing narratives when it comes to Juan Sanchez. So host Maria Hinojosa and producer Antonia Cereijido travel to Austin, Texas, to see which one was the correct one. No, Senator Cruz. The President is insisting on a path to citizenship because that’s the only way to deal with the problem of residents who are not documented. The way to prevent future undocumented residents is to craft a guest worker program that will work in the real world, not the paranoid delusions of the average Republican. …You and your kind are on your way out, Mr. Cruz. Enjoy your 6 years, because it’s all you will have as Senator unless the GOP wises up. Facebook Status backdated to the blog. The Austin American Statesman moved their blogs. Archive.org has a First Reading summary here. Beto O’Rourke almost got Cruz’s seat in 2018. Look Ma, I Can Write Again! I Passed! Most of you will not. Read ranthony's Newsletter on Nuzzel.